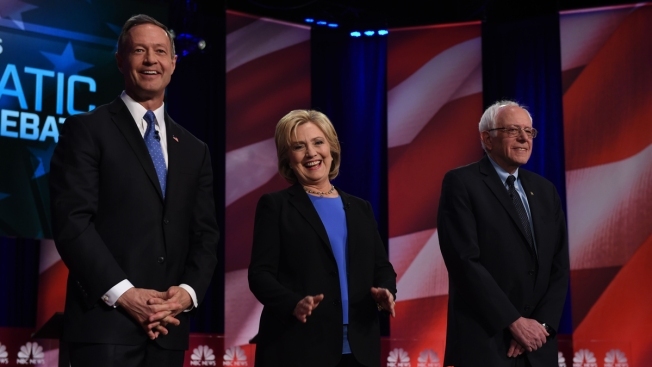 Democratic presidential candidates, former Maryland governor Martin O'Malley (L), former Secretary of State Hillary Clinton (C) and Vermont Senator Bernie Sanders (R) arrive on stage for the Democratic Candidates Debate on January 17, 2016. MSNBC and the New Hampshire Union Leader are teaming up to host an unsanctioned Democratic presidential debate on Feb. 4, the newspaper announced Tuesday. The only question now is whether all three candidates will participate. Martin O'Malley's campaign has already told the Union Leader that he will take part, while the Clinton campaign indicated it would join if the other candidates did. The Union Leader announced the debate on Tuesday afternoon. It would be held five days before the first-in-the-nation New Hampshire primary. "Meet the Press" host Chuck Todd and MSNBC anchor Rachel Maddow are scheduled to moderate. According to MSNBC, the debate will be broadcast live in primetime. Maddow mentioned the debate plans on her show Tuesday night, casting some doubt on whether it would come together: "I'm not sure at this point if it's actually happening." The Democratic National Committee said the party has "no plans" to sanction additional debates before the Feb. 9 New Hampshire primary, Chairwoman Debbie Wasserman Schultz said in a statement. Supporters of Democratic candidates Bernie Sanders and Martin O'Malley have been pushing for months for additional debates. The Democratic National Committee only scheduled six for the primary season, far fewer than the Republican party. Bernie Sanders' campaign called for working with the party after the New Hampshire primary to schedule more debates, meaning Clinton's participation hinges on Sanders. “Hillary Clinton would be happy to participate in a debate in New Hampshire if the other candidates agree, which would allow the DNC to sanction the debate," a Clinton representative said in a statement. Asher Klein and The Associated Press contributed to this report.